Many years ago, back in 1991 to be exact, I had started writing my first Young Adult Novel, The Lost Scrolls of Newgrange. For those of you who have never heard of Newgrange you don't know what you're missing. This megalithic structure, over 5,000 years old (older than the Pyramids or Stonehenge in fact) was built back in Neolithic times. Approaching this ancient edifice, visitors could easily mistaken it for an extra-terrestrial vehicle which has accidentally plummeted to earth. Tons of rock and dirt have been heaped into a saucer-shaped structure. At the front, a wall of glittering quartz crystals lead the eye to a deep recess - what could well be (and perhaps is) an entrance to the Spirit World. Immense kerbstones, many decorated with intricately carved megalithic artwork that echos design patterns found in contemporary Irish art and fairly recent Irish sweaters, form the base of this mystery. Above the gloaming doorway, a roof-box has been constructed with amazing precision. On Winter's Solstice - the shortest day of the year - the rising sun perfectly aligns with this small entrance. As the sun breaks over the horizon watery sunlight filters through the roof-box, lighting the 19 meter long passageway behind it; at last penetrating the deepest recesses of the structure: an ancient cruciform chamber constructed at its very core. If you stop and think about it, that kind of engineering accuracy is astonishing when you consider that ancient contractors did not have the benefit of modern tools. Nope. They had none of that. Instead, it appears that these good people first manually quarried the kerbstones, quartz, and other immense rocks from as far away as County Wicklow, a good 50 miles south. Somehow, they moved these monsters down to the Irish Sea, and then in all probability boarded them onto boats to be brought up to the River Boyne estuary (located in the town of Drogheda in County Louth). From there, they sailed down the Boyne - against the current it must be noted - to be finally deposited at Bru na Boinne, a gentle but apparently strategic turn in the river. And then it was just a matter of building the darned thing. Easy peazy, if you happen to be constructing a child's toy. But this is no toy. Today, visitors to Newgrange must first go to a wonderful Visitors' Centre located across the river but still quite near the monument. From there they are transported by bus to Newgrange itself. But back in 1991, back when I was researching that first book, it wasn't quite like that. Instead, all you had to do was drive a car up to the monument, pay a few pence in admission to the Office of Public Works employee who shivered behind the thin walls of a wooden shed, and the place was pretty much yours. But for me, it was even better than that. When I told the lady minding the admissions shed that I was researching a book on Newgrange, she could not be more helpful. "Now you just do what you need to do," she said. "Walk anywhere you want." "Anywhere?" I asked. "Ah, fer God's sakes. Isn't that what I said? Just don't be falling off the thing because I don't need the bother." I took her at her word. For the next two hours, I had complete access to one of mankind's engineering - and spiritual - triumphs. I of course walked completely around the structure, making notes of the fantastically sculpted kerbstones. Then I entered the monument. I'm not exactly the tallest of people, but even my short frame had to bend to avoid hitting the roof of the passageway. I walked up the rocky incline and into the chamber itself. My eyes adjusted slowly to the poor light. Shadows shivered upon the stone walls, as did the nape of my neck. Here was a place made holy by people long ago, whose spirits would seem to still walk among these ancient works. Here, at my feet, engineers had knelt going about their trade. Their sweat and blood had created walls and ceilings which still stood over five-thousand years later. Here in this same space and only years later, the remains of local people were cremated, ash and broken bits of bone placed in small bowls for reasons that are still unknown. As sacrifice? In reverence? In hopes of an afterlife? And though it was high summer, in my mind's eye I felt the cold of Winter Solstice and imagined a soft light causing the chamber to glow with the beckoning light of spring. And I felt those that had come so long before me grow even closer. I wandered out of the chamber then, taking those ancient engineers with me. I walked up onto the very top of Newgrange and I know now that I am one of the very few who have had such a privilege. There, in the setting sun, I beheld the waters of the River Boyne below me glitter like galaxies of stars. And in the evening mist, I could imagine those ancient ones rolling the immense stones on great timbers up the hill from the river to the place where they would rest, and still do. I felt a kinship with those long ago people of Ireland. It was as if I could feel their breath upon my cheek. But that was probably only the summer breeze that blew so gently upon me. Remembering back, I count myself lucky at the memory and of my life here. I know now, from my many walks around the country to so many ancient cathedrals and standing stones and castles and monasteries that I have never been alone in Ireland. Others walk with me as I breath in the timeless fragrance of the countryside. And I can't help but wonder still if on that occasion - on that special trip to Newgrange - those ancient engineers weren't with me. The book as it turned out was a great success. Influenced, I'm sure, by the magic that I encountered on that day. Newgrange is still there. And I like to think that the spirits of those amazing engineers protect it to this day, inviting all to take part in the legacy that they so carefully constructed. 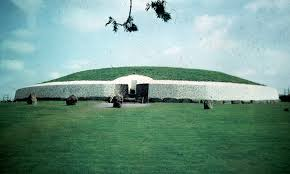 For more information on Newgrange, go to http://www.newgrange.com/ or simply Google 'Newgrange'. And while you're at it, why not just come over and experience it for yourself?